The San Diego Gulls have been hot as of late and their return from a Midwest road trip only displayed a continuation of their dominance. The team is currently fighting to make their way back into playoff position, and face a tough stretch of games here in the coming weeks against teams ranked 1st, 2nd, and 3rd of the Pacific. Tonight’s game was the first played at Valley View Casino Center since January 11th meaning the first since the Chargers departure from San Diego. 12,920 fans (maximum capacity for VVCC) braced the thunderstorms and flooding across the county and filled up the arena by the start of the second period. Fans who planned ahead of the storm arrived in the beginning, stragglers stuck in traffic showed in the middle frame, and those still at VVCC by the end all had something to celebrate; an ideal way to fully capitalize on gaining market share in a city that the media believes is “out of options” in sports until an NFL team returns. The stage was set, the San Jose Barracuda entered at 2nd in the division with a killer penalty kill and power play offense while the Gulls came in at 5th. The last time the Gulls had seen the likes of San Jose was at SAP Center, the offense was slow and Goaltender Troy Groesnik posted back to back shutouts to even the season series at 2-2-0-0. Tonight, the San Diego Gulls tallied 5 goals on 35 shots (including an empty netter by Kalle Kossila). Scoring started early for the Gulls as Samuels-Thomas notched his 5th of the season in just 1:52 seconds in the first period. The rout of the Barracuda would continue as Scott Sabourin tallied his 3rd of the season with just over 20 seconds remaining in the first frame. Nick Sorensen had a huge power play goal assisted by All-Star Brandon Montour and Chris Wagner in the second period to make the lead 3-0. Going into the final frame, the Gulls defense looked incredibly strong, only allowing 3 shots in the second and outshooting the Barracuda 26-13. However, the Barracuda attempted to rally their way back into the game and their offense picked up the pace. The Gulls Rookie leader in points in Kalle Kossila added an insane lacrosse style Sportscenter Top-10 worthy goal just over halfway into the 3rd period. The Barracuda allegedly found the back of the net at some point a minute after Kossila’s goal as a goal was eventually added, only after a dirty shot from a Cuda shoulder sent Jordan Samuels-Thomas head into the board. He skated off the ice under his own control but did not return to play. Kalle Kossila tallied the night’s second “phantom goal,” as he was fouled on the breakaway with an empty net. Scott Sabourin added a hellacious fight in which he dominated his opposition to the ground with ease, only to flip his helmet, salute, and energize the crowd. Jhonas Enroth who the Gulls recently acquired in a trade with Toronto made his second consecutive start and once again held the opposition scoreless into the 3rd frame. In 120:00 now in his young Gulls career, Enroth has posted 54 saves with only 2 goals allowed, a GAA of 1.00 and a SAV% of .963. The start tonight was Enroth’s first start in front of the home crowd and we are assured he and the rest of the team loved the atmosphere. 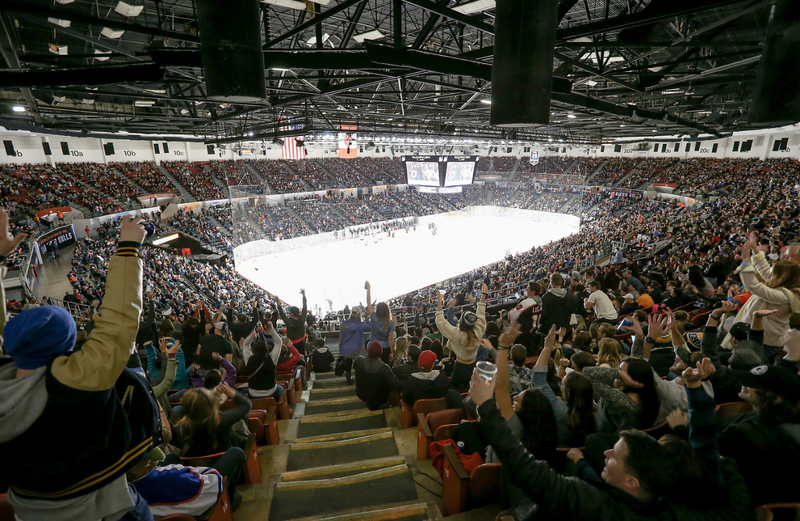 12,920 was a number the Gulls had seen only once, exactly 100 regular-season games ago on opening night of the 2015-2016 season campaign. Fans poured in from across the county dodging the pouring rain to either see the team they loved or for many; a potential new team. Head Coach Dallas Eakins noted the energy prior to the game and after remarked: there was an incredible energy in the building, the fans were getting the wave going. It was certainly electric”(@SDGullsAHL Twitter). Any first-time hockey-goers were surely made into full-blown hockey fan as the night was filled with incredible fast past action, highlight reel worthy goals and saves that will be talked about for months and of course fighting. Folks leaving VVCC all had smiles on their faces: the rain had cleared up and the Gulls brought a new faith to the community of San Diego.